A planned Tube strike on Boxing Day could be a major blow to London's shops, business leaders have warned. Drivers are due to walk out in a row over pay, on what the British Retail Consortium says is now one of the biggest shopping days of the year. Its director general Stephen Robertson said due to the severe weather and student protests, retailers in London needed a strong start to the sales. The drivers want extra pay and a day in lieu for working on 26 December. Members of the train drivers' union Aslef are planning a 24-hour walkout on Sunday, claiming they should be given three extra days' pay and a day off in lieu for working the bank holiday. But London Underground maintains the union had previously signed up to an agreement which covered bank holiday pay arrangements. Mr Robertson said: "This could be a major blow for London's retailers and their customers on what's now one of their most important days of the year." 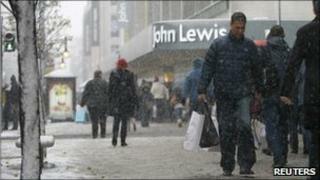 He said up to 38,000 jobs directly depended on a successful retailing sector in the capital. Mr Robertson said retailers also faced a difficult time in 2011 with the rise in VAT and public sector cuts taking effect. "Everyone involved in the Tube drivers' dispute needs to recognise the importance of London retailing and the damage disruption on this scale will cause," he said. Baroness Jo Valentine, chief executive of business group London First, said: "It's not too late to bring seasonal good tidings to London by sorting out this unnecessary dispute."